This is a long and widely varied route, crossing the water-plentiful central part of Naxos. Starting at Agii Apostoli, the largest settlement of the village of Melanes, we cross the lush Melanes valley and will take you past a number of sights, including the Church of Agios Georgios –initially a late Roman structure and one of the first venues of Christian worship identified on the island, with frescoes of various historical periods. The trail follows an elliptical course, below the installations of the ancient aqueduct, which can be visited, and ends at Flerio. There, you can see the archaic sanctuary by the water springs and the half-finished, giant, 6th century BC statues of Kouroi in the area of the quarries. From Flerio, the trail initially goes uphill on a wide footpath towards Potamia. Along the route you will see threshing floors and lime furnaces in good condition. A marble paved pathway leads to Ano (“Upper”) Potamia, with the water-plentiful ancient fountain. Potamia’s three settlements (Upper, Middle and Lower), with their impressively preserved traditional architectural profile, adorn the valley which is dotted with watermills, historic chapels and tower houses, threshing floors and olive presses. 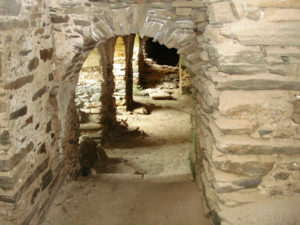 After Ano Potamia the trail forks out, with one leg going slightly uphill toMessi (“Middle”) Potamia, crossing the settlement and rejoining the second leg alongside the stream at the shady Platanaki position,with a traditional, stone-built laundry facility. At Lierado position, a downhill detour will take you to Kokkos tower, rising above the gully. After reaching Kato (“Lower”) Potamia, the route takes you through fruit orchards to rejoin the stream.